Note: To install XEBEC 1220 on your system, access the Drive Type Table that corresponds to your on-board BIOS and select your drive type. 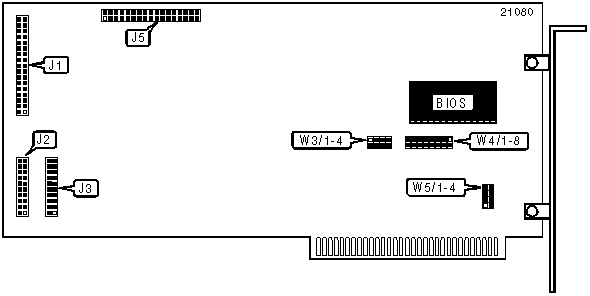 Set drive type jumpers W5/1-W5/4 as indicated and use the ROM address to access the BIOS Address Selection Table. W4/1-W4/7 jumpers should be set according to this table. Note: Drives with IBM or Xebec formats use DOS FDISK.COM to set up partitions and DOS FORMAT.COM to initialize directories & create boot tracks. To format drives with no low level format, run IBM’s adv. Diag. Program option 17 or a Menu Program accessible through DOS DEBUG.COM (available for BIOS types 104959 and 102168). If DEBUG.COM is selected, use drive type characteristics to select a ROM address from the tables. Set W4 to reflect this address and at the hyphen prompt, enter "-g= ‘ROM address’"
Note: W5/1 and W5/2 define the first hard drive. W5/3 and W5/4 define the second hard drive. Note: The BIOS position on board may vary.